​It’s been an absolutely gorgeous early fall Sunday. I’ve had a really laid back day, a quick breakfast, some errands, and grocery shopping. By the time I got to the store our sunny day had really warmed things up, and I was shedding my hoody, and thinking about the coming week. Weather is a fickle thing in the state of Michigan and this month has proven that! I have been aching to do my fall decorating, especially when we get a cooler day. But this week back into the sunshiny 80’s, and I’m a little bummed. I love the warm weather but there’s something “warm” too about the autumn season with all of it’s colors and smells. 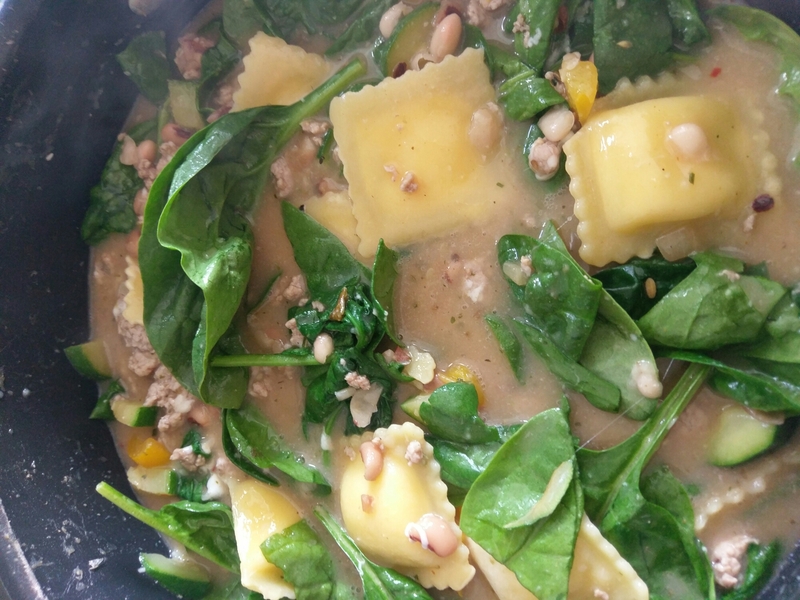 So I found myself trying to will the autumn weather to come back by making a fall favorite; sausage and ravioli stew. There’s something about a simmering pot of stew, or soup, or chili that really speaks to this season. Now all I need is a cable knit sweater, and a big fluffy blanket by a bonfire…life is good. In a Dutch oven saute onion, peppers, zucchini, and sausage until sausage is cooked through and no longer pink. Add the seasoning packet, beans, peas, broth, and water heat to a low boil. Add ravioli cook until tender. Add spinach and let it wilt stirring occasionally. Simmer on low for another 10min. Serve hot. Add a little mozzarella cheese upon serving if you’d like. Happy cooking, Enjoy! !